Got another call from a client . . . a big client with lots of lawyers . . . asking me about one of his brand spanking new attorneys who has just been bestowed an award as a Top 10 Personal Injury Attorney in his state by The American Institute of Personal Injury Attorneys. The nomination came along with the request to send a check for $275 within the next month and information on where the AIPIA site should link to. So, I thought I’d do some digging on the esteemed American Institute of Personal Injury Attorneys. According to their site, they have pretty stringent requirements for admittance, so it was odd that a wet-behind-the-ears, unpublished, unrated, unknown junior associate had made it past this evaluation gauntlet. 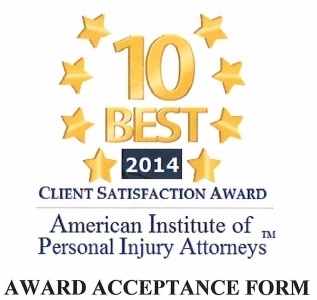 Very few Attorneys can display our “10 Best” Badge on their website or Plaque in their office. AIOPIA has a stringent and multi-phased Selection Process which begins with peer nomination and ends with final approval by our Board of Regents. Membership is an exclusive honor and extended only to those select few who have reached the top of their profession while doing so with the client’s satisfaction being of the most paramount importance. Maybe their office location will be a little more insightful . . . so I fired up Google Street View and found the headquarters of the American Institute of Personal Injury Attorneys located . . .
Great – you can presumably celebrate with a congratulatory cheeseburger and coke next door if you pick up your plaque in person. And don’t worry if you aren’t a PI lawyer . . . located within that same UPS store, you can find the American Institute of DUI/DWI Attorneys as well. 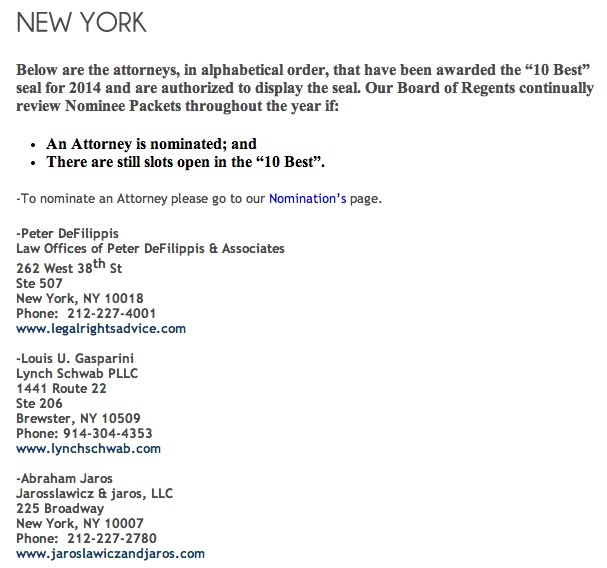 Perhaps they’ll soon create The American Institute of Legal SEO Consultants and I too can have a Top 10 Badge. This might seem like an easy way to buy links(and a plaque), but . . . . These types of sites are exactly what searches engines look for algorithmically – domains with no authority (both American Institute pages have Page Rank of zero) containing pages with nothing but lists of businesses with followed links. I can’t promise that these specific sites would trip a search engine red flag, but I’d steer all of my clients away from something like this. I’ll let you guys ruminate on the ethical ramifications of these awards . . . .
Oh this gets even better. Someone just forwarded me a link to The National Academy of Personal Injury Attorneys. Are these two vicious competitors? I don’t think so – the NAPIA is built on the exact same website platform, with the exact same award structure (Top 10 and Top 10 Under 40) and essentially the same nomination and vetting process as the AIPIA. Are they located in the same UPS store as The American Institute of Personal Injury Attorneys? 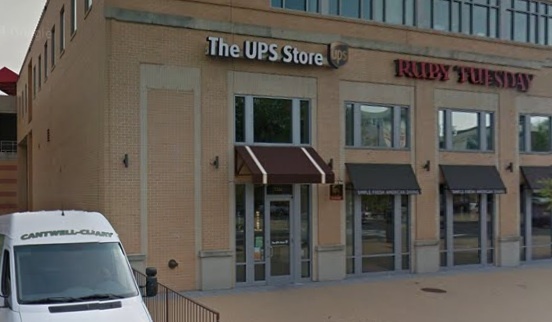 Nope – the NAPIA is housed in virtual office space on K Street, a short 5 minutes from the headquarters of the AIPIA Headquarters/UPS Store. I’m off to take a very hot shower and gargle some bleach.